I'm so thankful as we cross into vacation land, my wonderful husband gets to get a break, and we all get to spend tons of time with many of our favorite people. It's going to be great! Here's our little cowgirl, at least for today. A picnic, they love those. It's not always super conducive to eating. Love her face. Crazy kids. They both got up and walked away when they decided it was no longer working out. The blanket it tiny, not much room for a wiggly Norah and her nearly six year old sister. Norah & Bayli chillin. Bayli and I had a great day, she did my Shred video with me as well as hot yoga in the evening. She did so great! We also got a ton of things knocked off my to-do list today, got to love that! Nor wearing Bay's belt, she was so proud. Just a *few* from the phone. 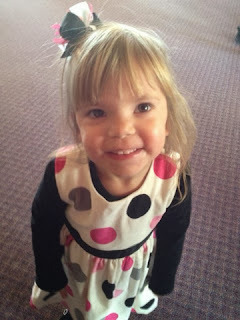 : ) Here's our happy little Sunday School girl. Auntie Love. And Ava, with her dog Rosie. My girl. Sequence Fun! Waiting for her turn. Duck, Duck, GOOSE. They need more players. Norah found her dog...again! Why oh why is her favorite toy so small AND their favorite thing to hide??! Movie night at Ava's school. Monsters University. I shall re-vow not to take Norah next time. She only cares about the movie for about 20 minutes. The rest of the show?? PAINFUL. Play date at Sophia's, dress up heaven. Baby it's COLD outside!! Burrrr. Mixing. We are very excited about all the fun things to come this week, yay!! I've got no time for photos, I'm too busy obsessively planning & pinning recipes for Thanksgiving. It's only a week away!! I can't wait! I love this time of year!! My goal for this year? Make the dishes I cook as healthy and delicious as possible, without making all the die-hard traditionalists roll their eyes and scoff. I'm just kidding, my family does a great job cooking that way regardless, so it shouldn't be a problem. I'm also hoping to make it a great meal for my mom who has all kinds of food restrictions. I love the challenge, it makes it that much more fun to have to think outside the box. I'm so thankful for our wonderful family, we've made a tradition out of spending several days together over the holiday and it is something I look forward to so very much!! I know I've been a little MIA this week, the girls and I have been at the beach since Friday. For some reason I never get around to blogging when I am there, I guess I'm just too busy having fun. I barely took any pictures either, strange, I know. 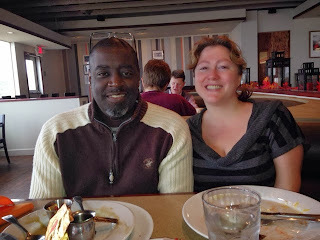 The goal of the weekend was to spend some time with Will, Jessica's new boyfriend. Mom & Linda both hadn't met him yet and we are about to go away together for Thanksgiving and it seemed like we should all get to know him better before that. 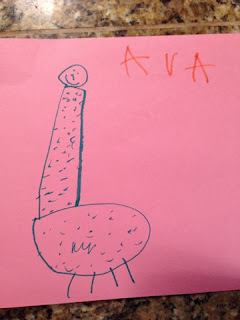 So Ava drew this giraffe. "So mommy LOVES the giraffe huh??" Um yeah, we will be saving this one to give back to her at her wedding shower or some event where she will be able to appreciate the humor in it. I'm trying to remember to take more videos of these kiddos! I love this one. It's so them.